1. In a saucepan with a tight-fitting lid, combine the cream, milk, and dried osthmanthus. Split the vanilla bean length-wise, scrape the seeds into the cream, and add the bean itself. Bring to a simmer, cover, and remove from heat. Let steep for at least ten minutes. 2. In a bowl, sprinkle the powdered gelatin evenly over the cold water. Let bloom for five minutes. 3. Add the sugar to the cream and milk mixture and return to medium heat. Cook until the sugar has completely dissolved. 4. Pour the warm cream mixture through a fine mesh sieve onto the bloomed gelatin. Stir until the gelatin has completely dissolved. 5. If you would like to unmold your panna cotta, lightly grease the inside of your molds with a neutral-flavored oil. Pour the cream into the prepared molds. 6. Refrigerate the panna cotta for two to four hours. To unmold, dip the bottoms of the panna cotta molds into a bowl of hot water and turn out the panna cottas. 1. 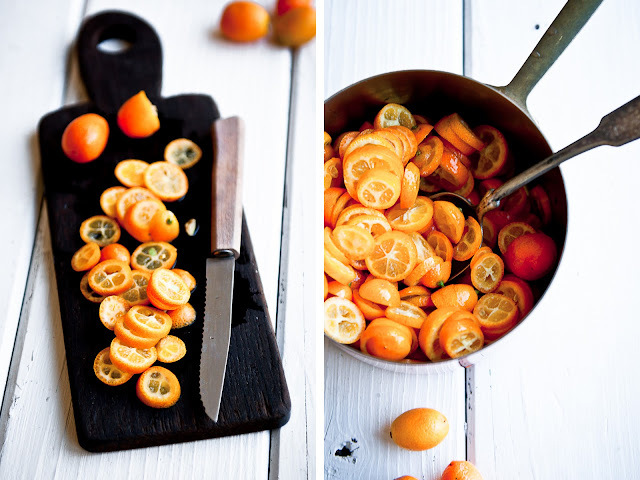 Slice the kumquats and place in a saucepan. 2. 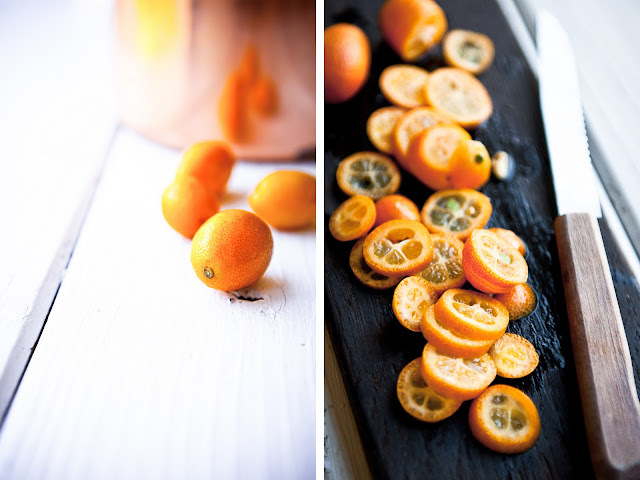 Split the vanilla bean length-wise and scrape the seeds into the kumquats. Add the bean as well. 3. Add the sugar and water to the kumquats and bring to a boil. Cook for about 20-30 minutes until the kumquats are translucent. 4. Drain the kumquats and return the syrup to heat. Return to a boil, cooking until the liquid reduces by about half. Remove from heat and let cool briefly. 5. 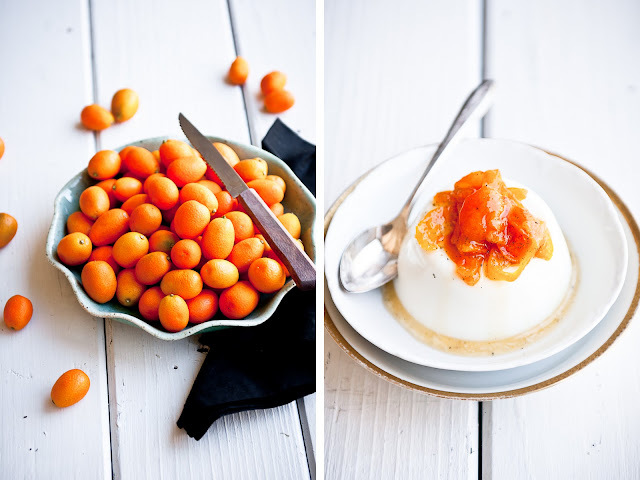 Serve candied kumquats and syrup over the panna cotta. I had my very first kumquat just a few weeks ago. I can totally understand why your third grade self was obsessed! They're awesome! 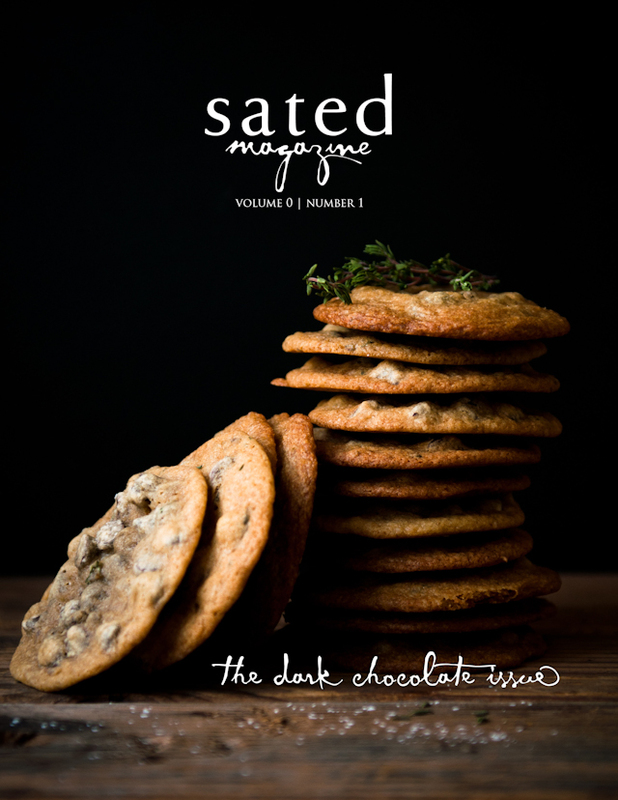 This recipe sounds amazing, as usual, and I love the moodiness of the accompanying photos. Congrats on the meeting/defense and good luck with your work! I don't care if it comes across as corny or a cliche but I love, love this post and all of the photos! The black and orange color contrast is beautiful and the smooth, silky texture of the panna cotta captured perfectly. Regarding the osmanthus flowers, currently my travel in HK introduced me to dried osmanthus flower jelly served at dim sum outlets. They're mighty sweet but comes in longish stems which I find weird chewing. I'm going to see if I can get your dried version and lug some back to Singapore. Such lovely pics, as always. Good luck on your dissertation proposal! Sounds like things are rolling along quite nicely. We do love panna cotta. There are so many flavors you can pair with it...even if it's an herbal panna cotta. I saw some kumquats in the market the other day. I'd really like to try this. Mmmm. I have a special fondness for kumquats, specifically stealing them from a neighbor's bush in Pisa, Italy, every morning for a weekend. Sigh. What does a girl need to do to get a taste of these delicacies, Steph? @Lauren: I didn't know kumquats grow in Italy, too! To me, they're still such an East Asian thing. Beautiful photos! This all reminded me of the kumquat tree my Grandmother had in her back yard in Davis. But back then I only ate things like bacon and cheese, not cool little fruits! Alas, the tree had to be chopped down several years ago before I was able to partake in it's goodness. 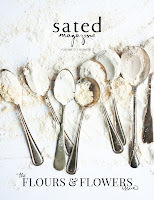 Thanks for the recipe, beautiful pictures, great text... and I look forward to read your exciting "food-bloggery news!" Oooh, this almost made my heart skip a beat. That is one of the most beautiful desserts I have ever seen. The vanilla bean is popping out on my screen!!! This looks fabulous.. I love how you colored your prop board too! I have to ask, what neutral-flavored oils would you use to grease the panna cotta molds? @With Love and Squalor: I use grapeseed oil because that's what I have lying about, but I imagine plain veggie oil would work, too? Just avoid things like fruity olive oils. @travellingfoodies: that's my favorite, too! i need to learn how to make it at home.